With the help of a good brother, Teresa started running to move past a bad situation. And now she’s paying it forward. Now — years later and having run multiple half marathons, Teresa thinks that Adam was right. And she’s paying that important insight forward in a big way. 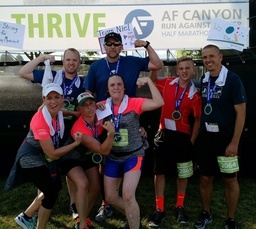 There are a lot of good reasons to run the AF Canyon Run Against Cancer. The cause — raising money to help people currently fighting cancer — is a great reason. The extraordinary view is another. One really great reason that tends to get overlooked, however, is running this race for yourself. Teresa’s story, however, is a great example that the experience of training, running, and completing something new and difficult can make a difference in your life. Getting help from someone who cared about her was an important part of this transformation. It wasn’t just her brother Adam who joined Teresa in her transformative first half-marathon. “He got my entire family involved,” says Teresa, “and that first year I had two sisters run it with me, two brother-in-laws, a nephew, and Adam." For each of the following two years, different family members have joined Teresa, taking in the unifying and empowering spirit of the event. Teresa notes that they have a tradition of sticking around at the finish line, where she likes to see the look on others’ faces that she has felt by doing this herself — and with her family.